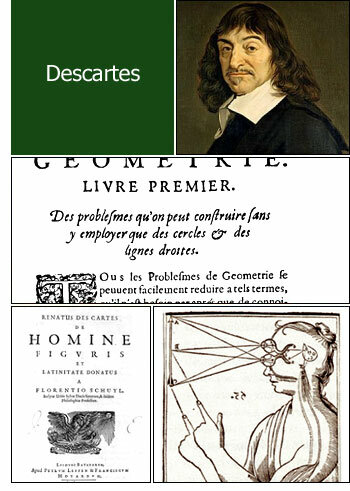 René Descartes was born at La Haye in Touraine (France), on March 31, 1596. Of the studies taught in the Jesuit school at La Flèche in France, mathematics alone was able to satisfy his craving for clear and certain knowledge. The years 1613-17 he spent in Paris; then he enlisted in the military service of the Netherlands, and, in 1619, in that of Bavaria. Descartes, also known as Cartesius, was a noted French philosopher, mathematician, and scientist. Dubbed the "Founder of Modern Philosophy" and the "Father of Modern Mathematics," he ranks as one of the most important and influential thinkers of modern times. For good or bad, much of subsequent western philosophy is a reaction to his writings, which have been closely studied from his time down to the present day. Descartes was one of the key thinkers of the Scientific Revolution in the Western World. He is also honoured by having the Cartesian coordinate system used in plane geometry and algebra named after him. His most famous statement is Cogito ergo sum (I think, therefore I am), found in paragraph seven of "Principles of Philosophy" (Latin). In 1625, on his return to Paris, he was besought by his learned friends to give to the world his epoch-making ideas. Though, to escape the distractions of society, he kept his residence secret, as he had done during his first stay in Paris, and frequently changed it, he was still unable to secure the complete privacy and leisure for scientific work which he desired. Therefore he went to Holland in 1629, and spent twenty years of quiet productivity in Amsterdam, Franecker, Utrecht, Leeuwarden, Egmond, Harderwijk, Leiden, the palace of Endegeest, and 5 other places. His work here was interrupted only by a few journeys, but much disturbed in its later years by annoying controversies with the theologian Gisbert Voëtius of Utrecht, with Regius, a pupil who had deserted him, and with professors from Leyden. His correspondence with his French friends was conducted through Père Mersenne. In 1649 he yielded to pressing invitations from Queen Christina of Sweden and removed to Stockholm. There his weak constitution was not adequate to the severity of the climate, and death overtook him within a few months. The two decades of retirement in Holland were Descartes's productive period. His motive in developing and writing out his thoughts was, essentially, the desire not to disappoint the widely spread belief that he was in possession of a philosophy more certain than the common one. The work entitled "Le Monde", begun in 1630 and almost completed, remained unprinted, as the condemnation of Galileo (1632) frightened our philosopher from publication; fragments of it only, and a brief summary, appeared after the author's death. The chief works, the "Discourse on Method", the "Meditations on the First Philosophy", and the "Principles of Philosophy" appeared between 1637 and 1644, - the "Discours de la Méthode" in 1637, together with three dissertations (the "Dioptrics," the "Meteors," and the "Geometry"), under the common title, "Essais Philosophiques". To the (six) "Meditationes de Prima Philosophia", published in 1641, and dedicated to the Paris Sorbonne, are appended the objections of various savants to whom the work had been communicated in manuscript, together with Descartes's rejoinders. He himself considered the criticisms of Arnauld, printed fourth in order, as the most important. The Third Objections are from Hobbes, the Fifth from Gassendi, the First, which were also the first received, from the theologian Caterus of Antwerp, while the Second and Sixth, collected by Mersenne, are from various theologians and mathematicians. In the second edition there were added, further, the Seventh Objections, by the Jesuit Bourdin, and the Replies of the author thereto. The four books of the "Principia Philosophiae", published in 1644 and dedicated to Elizabeth, Countess Palatine, give a systematic presentation of the new philosophy. The "Discourse on Method" appeared, 1644, in a Latin translation, the "Meditations" and the "Principles" in French, in 1647. The "Treatise on the Passions" was published in 1650; the "Letters", 1657-67, in French, 1668, in Latin. The "Opera Postuma", 1701, beside the "Compendium of Music" (written in 1618) and other portions of his posthumous writings, contain the "Rules for the Direction of the Mind," supposed to have been written in 1629, and the "Search for Truth by the Light of Nature." The complete works have been often published, both in Latin and in French. The eleven volume edition of Cousin appeared in 1824-26. Descartes died on February 11, 1650 in Stockholm (Sweden).